Like, it was said to Hinrich as he began to leave the locker room after an unusually long session of interviews for him, you weren’t earlier this season. Hinrich smirked. He does a good farm boy smirk. “Yeah, thanks for that,” he said. Hinrich is smiling more these days, though he is generally a happy guy. But his teammates and coaches are smiling a lot more for the tough, generally underappreciated competitor they know who reflects the hard work commitment of this Bulls team as much as anyone, but without the acknowledgement. Hinrich is fine with that, by the way. Hinrich doesn’t get a lot of credit for much, which suits him fine. He prefers to play the game, dress and be gone to be home with his two young daughters. The son of a basketball coach from Sioux City, Iowa lives the Midwestern ethic of modesty, character and diligence. He doesn’t do much that is flashy or stands out. So since he did Monday with one of great defensive plays of the season in his open court strip and steal from the high flying Paul George that helped turn around the game, Hinrich didn’t flee the locker room quickly to allow the other guys to do the talking. 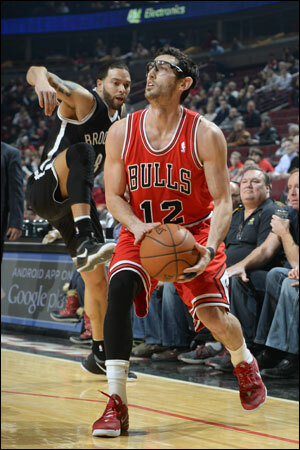 Some of Hinrich’s best moves are away from the limelight. Unless it’s on the basketball court. Then he’ll take on anybody without knowing he’s not a star as well. Hinrch’s more the action guy, though he hardly begrudges the spotlight to anyone. He’s grateful that it points elsewhere off the court. 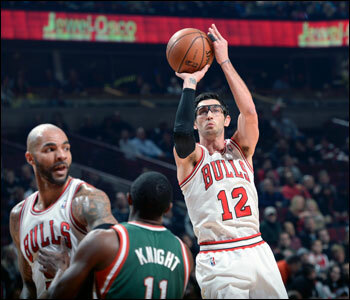 But his teammates and coaches appreciate that Hinrich shines during the game, if often not for the statisticians. There may be no one better to have your back. Hardly anyone as eagerly takes on the bigger, stronger, more talented and well known players in the game with more dogged determination. The 6-3 11th year pro is what Jerry Sloan would look like in this generation. Hinrich’s more athletic than the Bulls great and Hall of Fame Utah Jazz coach, if not as in demand on offense. But Hinrich plays the game with the same relentless spirit to give no quarter to anyone attitude. Richard Hamilton when he was a Pistons star would literally be driven to mania by Hinrich’s unending pursuit. Dwyane Wade would have some of his poorest games against Hinrich’s continual pestering. Perhaps the most fun for his teammates is to watch someone take a cheap shot at Hinrich and no matter the opponent’s size Hinrich is going right into him. Hinrich’s a guy they have to hold back. But it’s been a strange journey the last few years for the popular “Captain Kirk” after the Bulls traded him in the summer of 2010 to gain salary cap room for the pursuit of LeBron James. Hinrich went to a rebuilding Washington Wizards team that was a mess. He was traded midseason to Atlanta, which made the playoffs. But he was hurt in the first round and missed the conference semifinals series, which the Bulls won in six games. Hinrich had offseason surgery in 2011 and then had career lows in most categories in his final season with the Hawks in a limited role off the bench. As a free agent, he turned down larger financial offers to return to the Bulls before last season. Hinrich suffered a series of minor injuries last season with Derrick Rose out and the consensus became his body was breaking down from the way he literally throws himself at the game and opponents, the price to be paid for competing beyond most rational advice. Hinrich then played 60 minutes in the famous Game 4 triple overtime playoff win over the Nets as he ruptured his calf and was done for the playoffs. He worked vigorously last summer to heal and get in shape, but apparently it didn’t include his eye. Never a great shooter, Hinrich was competent and even the Bulls all-time leader in three-pointers made. But he’d begun to struggle with his shot, shooting a career-low 37.7 percent last season. It was exacerbated by the injuries, which drained strength from his legs. His shooting woes worsened this season as he shot 38 percent in November, 28 percent in December and just 25 percent on threes. Even worse, Hinrich stopped shooting, preferring to move the ball. But as you’ll hear around the Bulls, it’s a team that preaches the good shot. If you have it, take it! Players on the bench urge those on the floor to do so. Thibodeau only criticizes you when you don’t. The Bulls are not a productive offensive team. So they have to take advantage of their best opportunities. Hinrich wasn’t. He knew that had to change. Hinrich was put on a playing time limit between 25 and 30 minutes per game. He got healthier, and he worked on his shot, his posture, the small elements that are so big in the games. And he took everyone’s advice. He shot. And it’s been a big part of the Bulls run that has them a season best nine over .500 at 40-31 after the Monday win over the Pacers. With the Raptors’ loss Tuesday, the Bulls now are in third in the Eastern Conference. Hinrich still is shooting 39 percent overall for the season. But he is at just under 45 percent since All-Star break. He averages only about eight field goal attempts per game. But he’s up to averaging nine points, his highest in three years and second most since the 2009-10 season with the Bulls. Hinrich inched up to about 40 percent overall shooting in January, but he has taken off since. He shot 46 percent in February and 38.5 percent on threes. He’s shot 40.3 percent overall in March, but 45 percent on threes in March. Overall since the All-Star break, he’s shooting 49.2 percent on three pointers. He and D.J. Augustin have become a backcourt tandem to finish games as Hinrich moves over to defend the tougher shooting guards with Jimmy Butler at small forward. That fourth quarter lineup has stood up strong the last month. It’s also enabled the Bulls to have a more varied attack on offense with Augustin’s pick and roll and shooting ability and Hinrich able to get the ball moving quickly and into multiple pick and roll possibilities. And toward the basket with more certainty and accuracy. It’s sweet music to the Bulls.